Travel Associates members recently experienced the Delightful Danube 8-day Itinerary from Passau to Budapest with Uniworld. Hosted by Uniworld Head of Sales, Bradley Pallant, Travel Associates advisers Michael Davis-Smith, Lauren Duff, Mary Kelly, Briony Harris, Vanessa Tokatly, Stephanie Brown, Janelle Patrick, Amanda Haigh, Lisa Wattle, Carole Parker, Simone Rosa, Kate Horsburgh, Julie Morton, Damian Clark and Donna Elliott travelled with Emirates and boarded Uniworld’s newest Super Ship, S.S. Beatrice to experience the Delightful Danube 8-day Itinerary from Passau to Budapest. The S.S. Beatrice surpassed all expectations of those who attended the famil, as they sailed the Danube River visiting Regensburg, Passau, Melk, the Wachau Valley, Vienna eventually ending in Budapest. 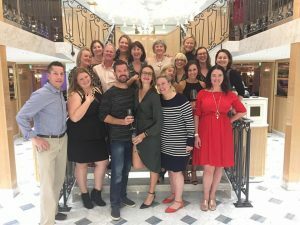 The advisers immersed themselves in all the onboard activities from the farm-to-table dining experiences in Mozart’s restaurant and the Chef’s Dinner in Max’s to enjoying the evening entertainment in Wolfgang’s Lounge. During the trip there was an abundance of activities that everyone took advantage of, including visiting the BMW Factory, a Bavarian river bike ride, visiting the Melk Abbey and a panoramic tour of Vienna including the legendary Opera House and St Stephen’s Cathedral.